The Spanish courts seek to suppress the Republic of Catalunya, in the name of the rule of law. The EU refuses to intervene, because it claims it's an internal Spanish matter. 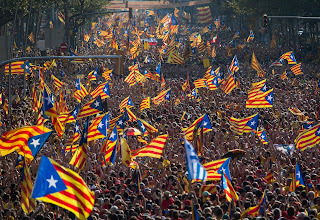 The EU has high claims to support fine-sounding principles, including human rights, democracy, subsidiarity, and the rule of law; and in claiming that, if finds itself, like a bullfighter in a fight the Spanish courts denied Catalunya the right to ban, on the horns of a dilemma of its own breeding. The Rule of Law is not synonymous with democracy; in fact, it is more often antagonistic to it. This is shown by the Catalan crisis. Law is, at best, a lagging indicator of a social consensus - but only when passed by delegates voting in their constituents interests. Law is more often passed by elites (the House of Lords, a Tory cabinet of millionaires, etc) in their own interests, or by elected representatives excessively or corruptly influenced by powerful interests through 'think tanks' and 'lobbyists'. This is particularly so in the Catalan case: the Spanish constitution was negotiated with fascists in Franco's dying days, and is fenced round with conditions which make it unalterable in practice. Even if there was a practical course to amend the constitution, the Catalans are a systematic minority in Spain. They do not constitute a majority, they can never muster a supermajority. They cannot change it. So where does that leave Carles Puigdemont and the Catalan Government? The courts said they could not hold a referendum. The electors, who elected them to office, said they must do so. The Rule of Law did not support democracy. Rather, democracy and the rule of law are in direct conflict. No man can serve two masters; the government of Catalunya chose to obey their electors. Here endeth the first part; the lemma, if you will. Now, let's move onto the thesis. Lawyers will argue that the law solves this problem: that the UN Charter and the ECHR are incorporated into Spanish law, and somehow trump the constitution, making the judgement of the Constitutional Court wrong. I say that argument does not hold. It may be that in this particular case there are ambiguities and paradoxes in the corpus of law by which one can contort the law into appearing to agree with the democratic decision of the people. But what if there weren't? Should the rule of law trump democracy? The principle of subsidiarity dictates that the people who should decide the governance of Catalunya are the people of Catalunya. The principle of democracy dictates that they must have a mechanism available to then to decide this. And in Catalunya especially, with its ancient tradition of civil society and its proud tradition of anarcho-syndicalism, the views of the people must surely trump the views of any governing elite. So where does that leave Donald Tusk, Guy Verhofstadt and the rest of the sclerotic cabal in Brussels? They can support the Rule of Law. Or they can support Democracy. They can't do both. It's time to choose.